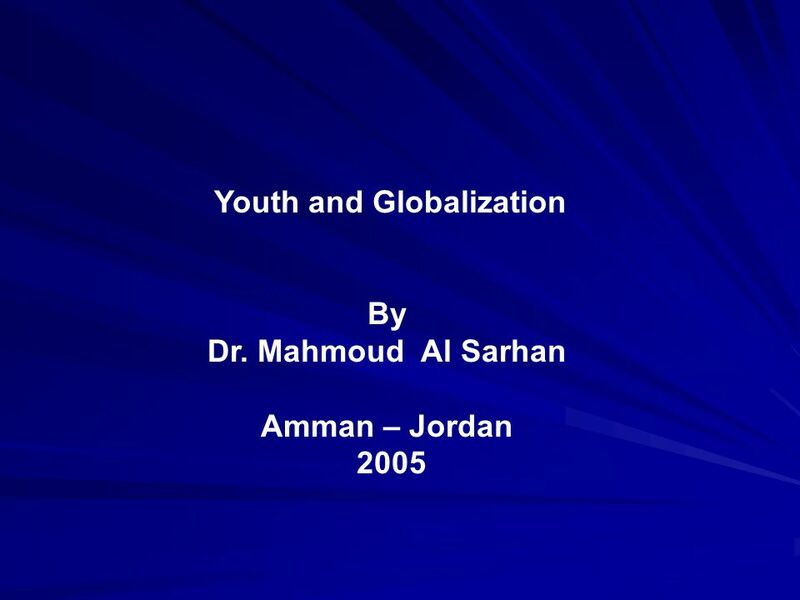 Youth and Globalization By Dr. Mahmoud Al Sarhan Amman – Jordan 2005. 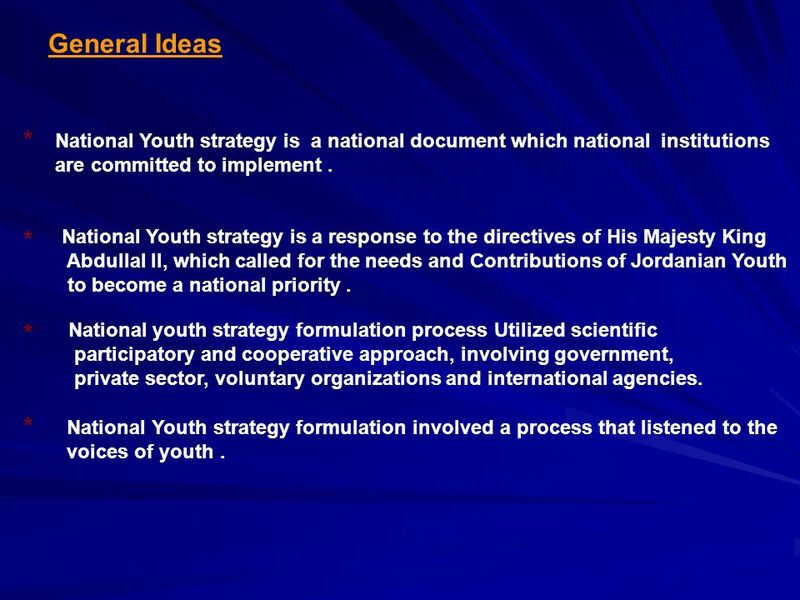 6 Rationale of the National Youth Strategy. Youth both male and female represent the largest segment of Jordanian society, and face the greatest challenges in terms of issues like employment. 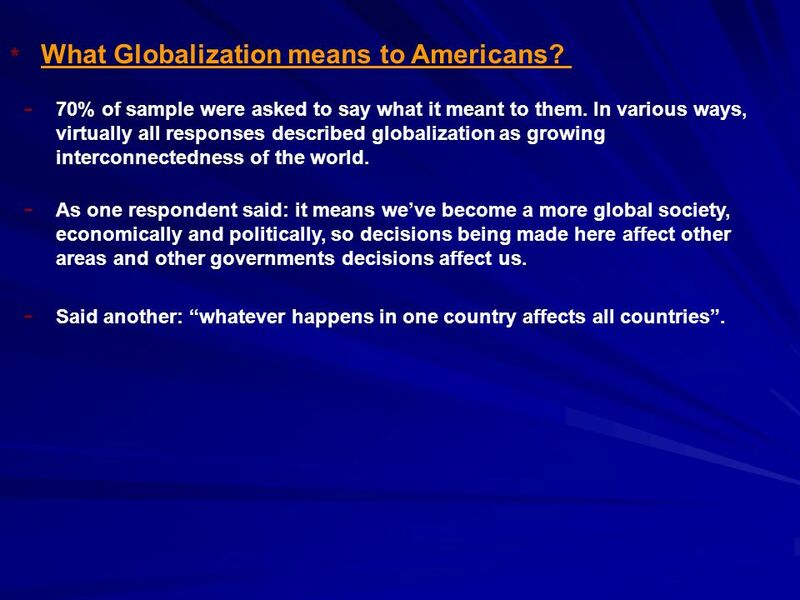 Health and globalization ….. etc. * National youth strategy is important as it provides youth and all agencies and groups committed to their development and Fulfillment with :- * A common vision. 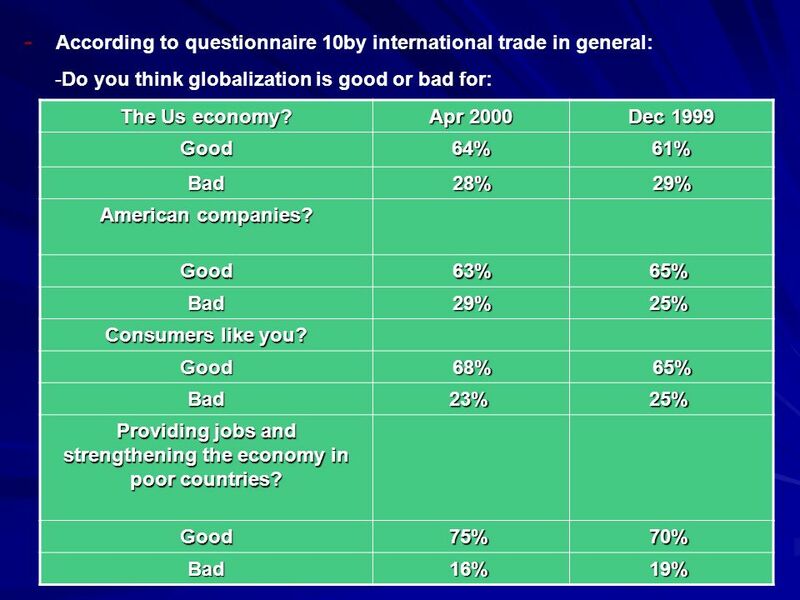 A set of priorities achieved through consensus. A national frame works for action. A statement of values and guiding principles. An instrument to raise the profile of youth. 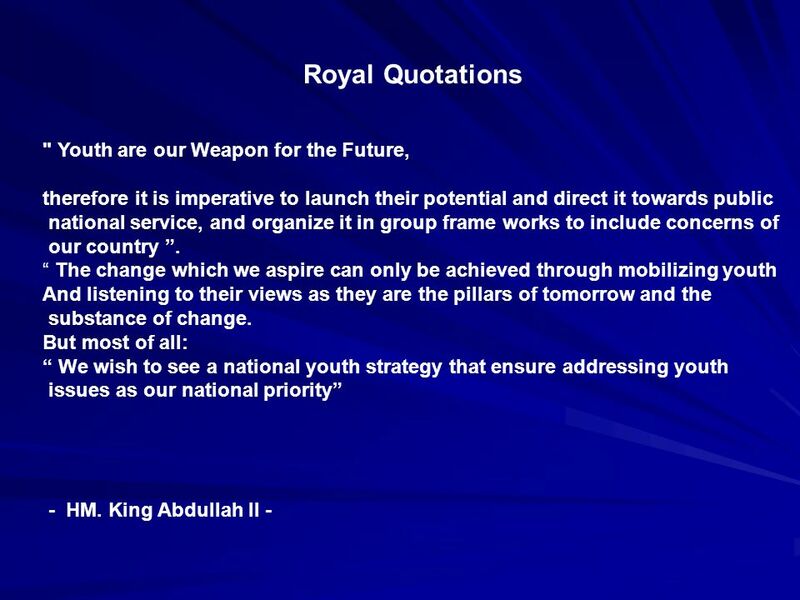 A declaration of the relationship between youth and national goals. A catalyst for communication, cooperation, and coordination and. A tool to benchmark and evaluate youth program relevance and achievement. 7 Guiding principles of the National Youth strategy. 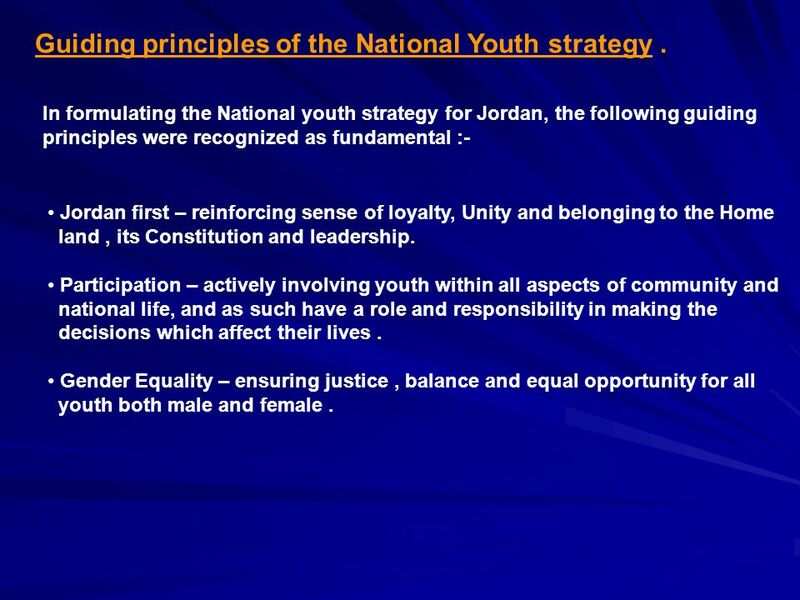 In formulating the National youth strategy for Jordan, the following guiding principles were recognized as fundamental :- Jordan first – reinforcing sense of loyalty, Unity and belonging to the Home land, its Constitution and leadership. Participation – actively involving youth within all aspects of community and national life, and as such have a role and responsibility in making the decisions which affect their lives. Gender Equality – ensuring justice, balance and equal opportunity for all youth both male and female. 8 Representative – building upon a deep understanding of the realities, potential, strengths, issues and aspiration of Jordanian youth. Access – enabling access to appropriate programs and services by all Jordanian youth regardless of age, gender, physical abilities, geographic location, social, Cultural or economic circumstances. Collaborative ownership – seeks the mobilization and participation of all stakeholders – government agencies, civil society, national and international institutions, private sector, and youth in designing and implementing the strategy, and maximizing collaboration and coordination efforts. 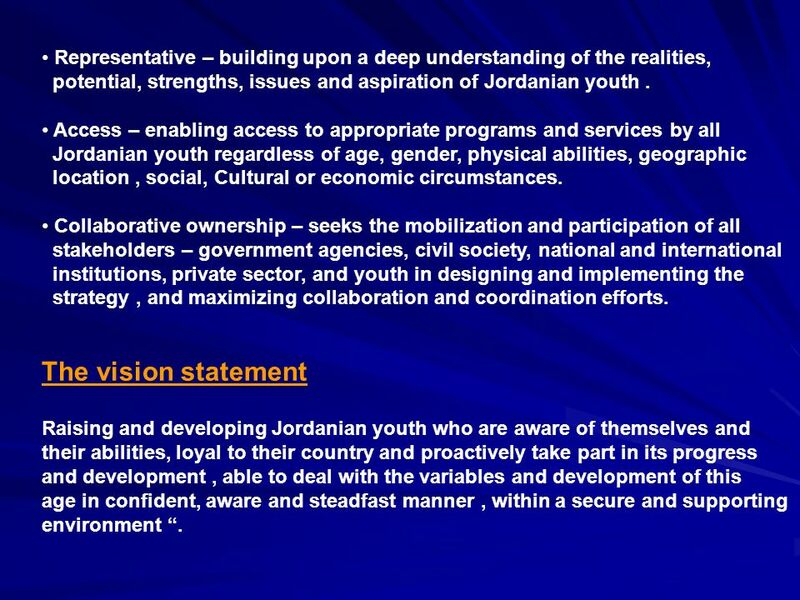 The vision statement Raising and developing Jordanian youth who are aware of themselves and their abilities, loyal to their country and proactively take part in its progress and development, able to deal with the variables and development of this age in confident, aware and steadfast manner, within a secure and supporting environment. 9 National youth strategy goals. 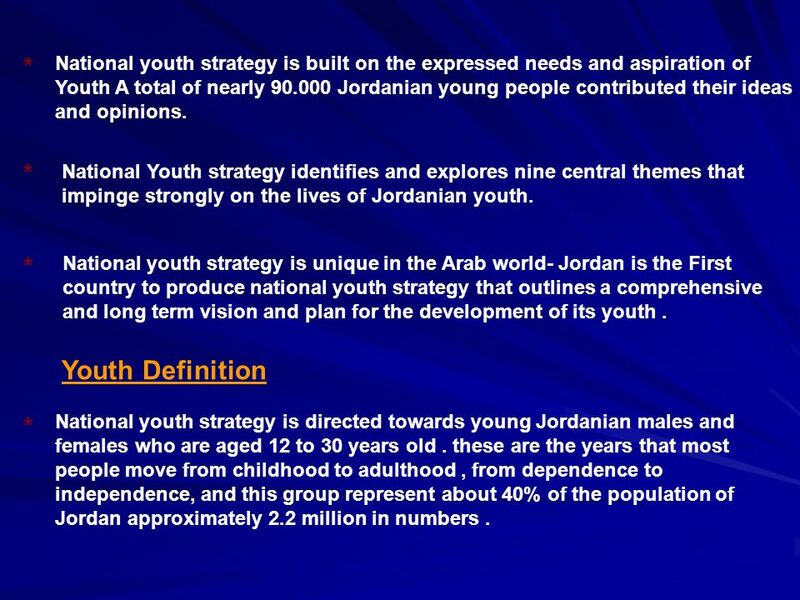 Provide and organized frame work for the efforts of those concerned with the care and development of Jordanian youth. * Enhancing youth development in away that reflects the uniqueness of Jordan. * Seeking to unify the efforts undertaken in this area, and setting the work priorities in order to reach a common vision for national youth development. 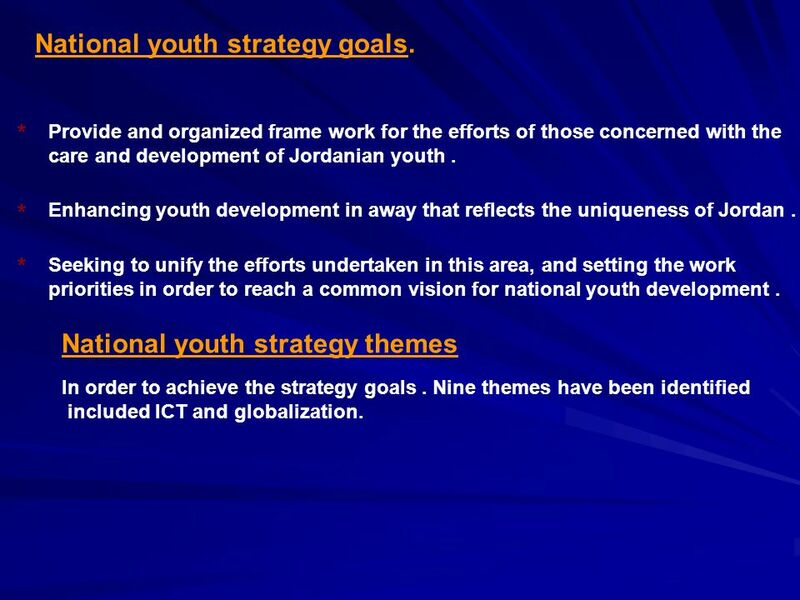 * National youth strategy themes In order to achieve the strategy goals. 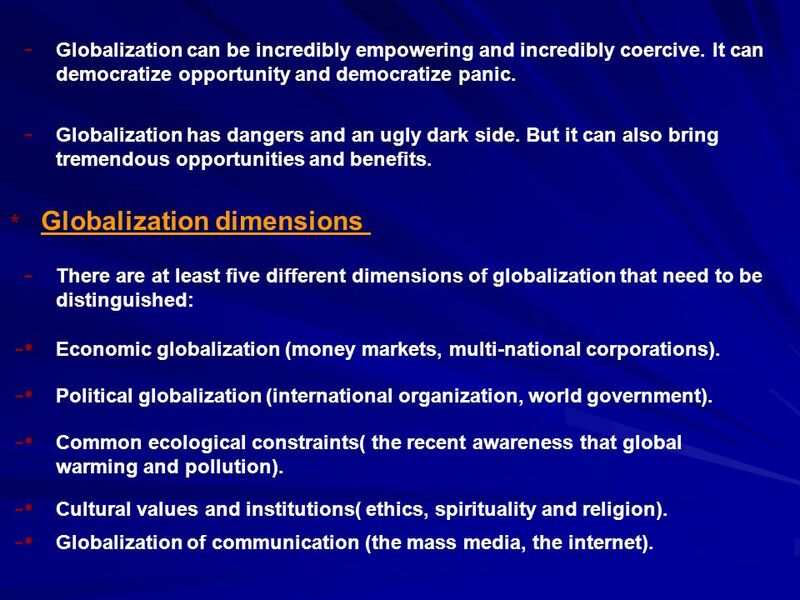 Nine themes have been identified included ICT and globalization. 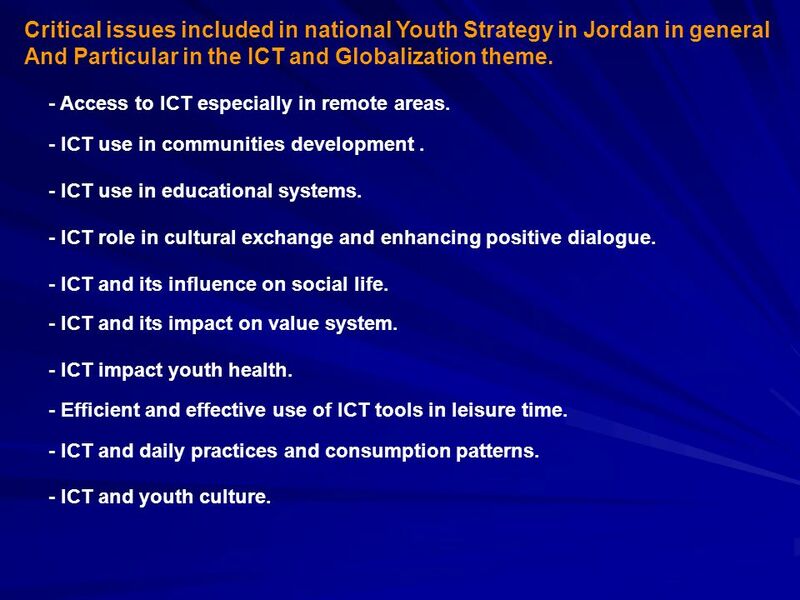 10 Critical issues included in national Youth Strategy in Jordan in general And Particular in the ICT and Globalization theme. - Access to ICT especially in remote areas. - ICT use in communities development. - ICT use in educational systems. 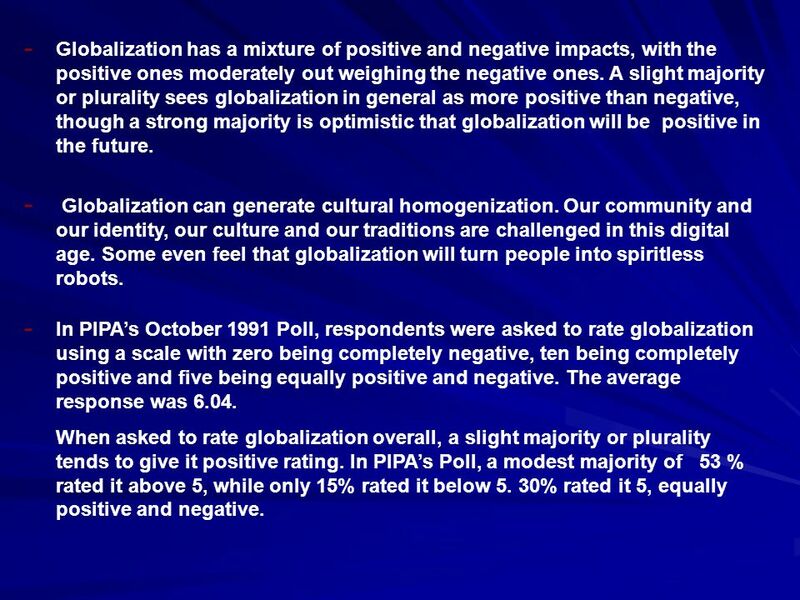 - ICT role in cultural exchange and enhancing positive dialogue. - ICT and its influence on social life. 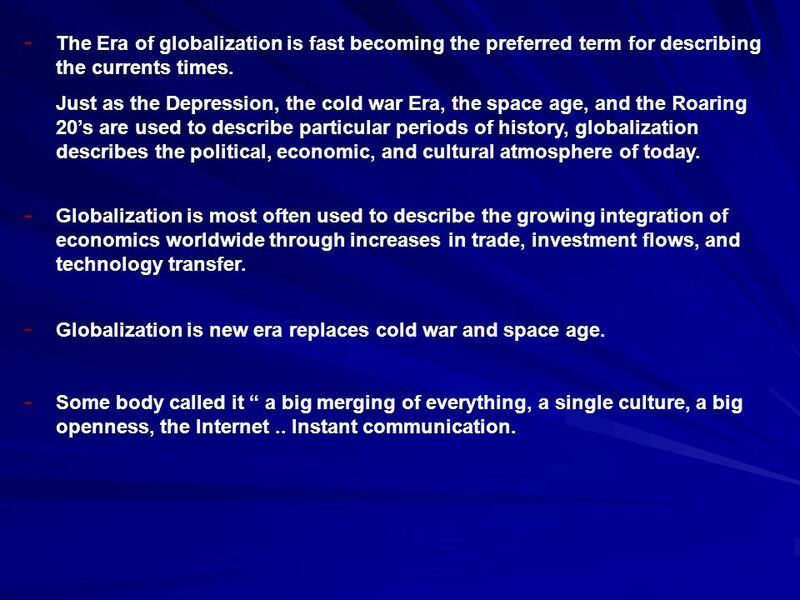 - ICT and its impact on value system. - ICT impact youth health. - Efficient and effective use of ICT tools in leisure time. - ICT and daily practices and consumption patterns. - ICT and youth culture. 11 - Encouraging, supporting, and efficient utilization of youth initiatives in ICT. - ICT and chances it could create for youth with special needs. 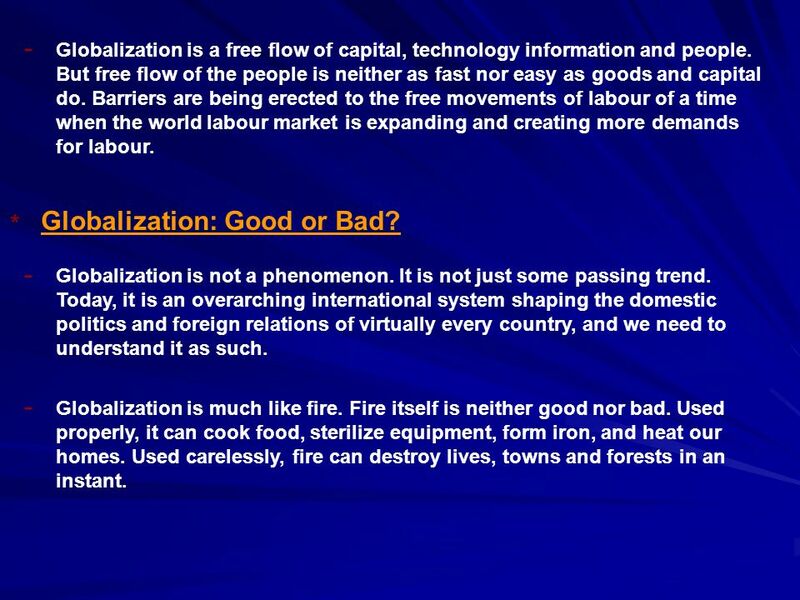 - ICT and internet effective handling (internet market,.. Etc). 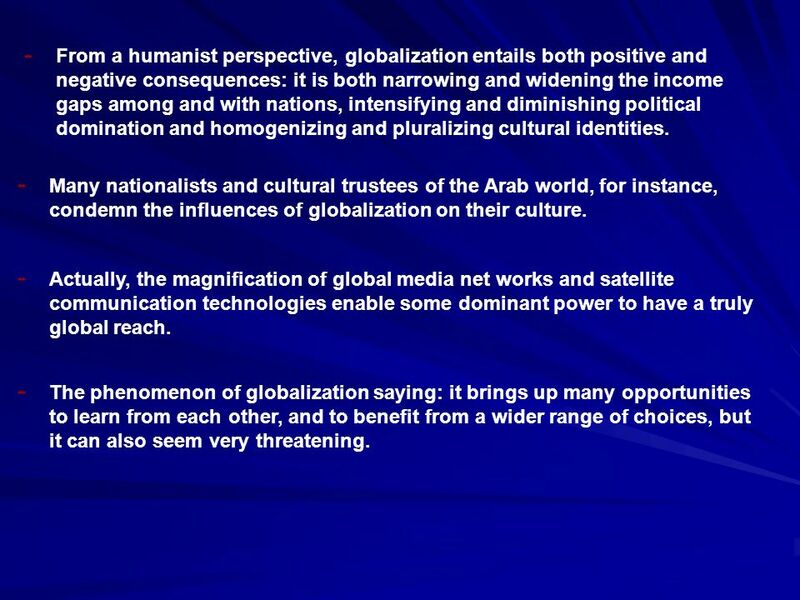 Information Technology and Globalization * This theme focuses on issues and strategies that will enable Jordanian youth to effectively benefit from national investment information technology and global opportunities available through ICT. Strategic objective. 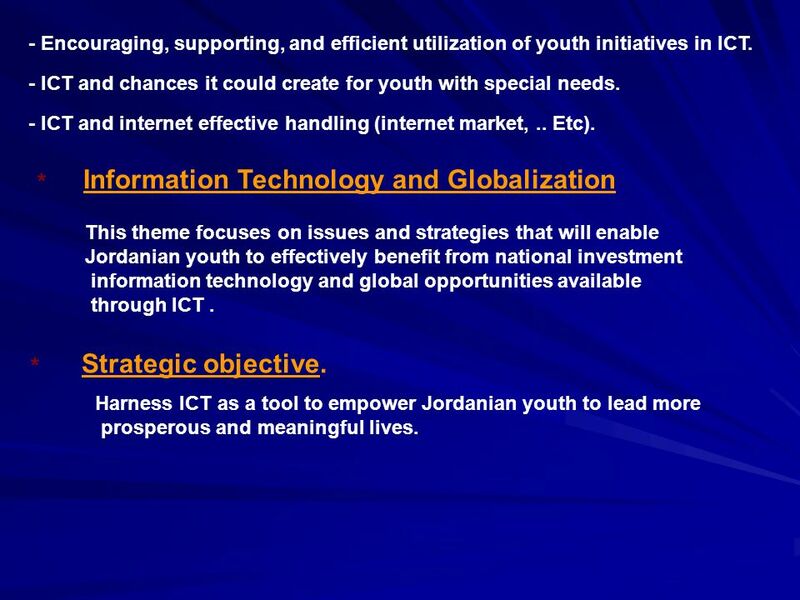 * Harness ICT as a tool to empower Jordanian youth to lead more prosperous and meaningful lives. 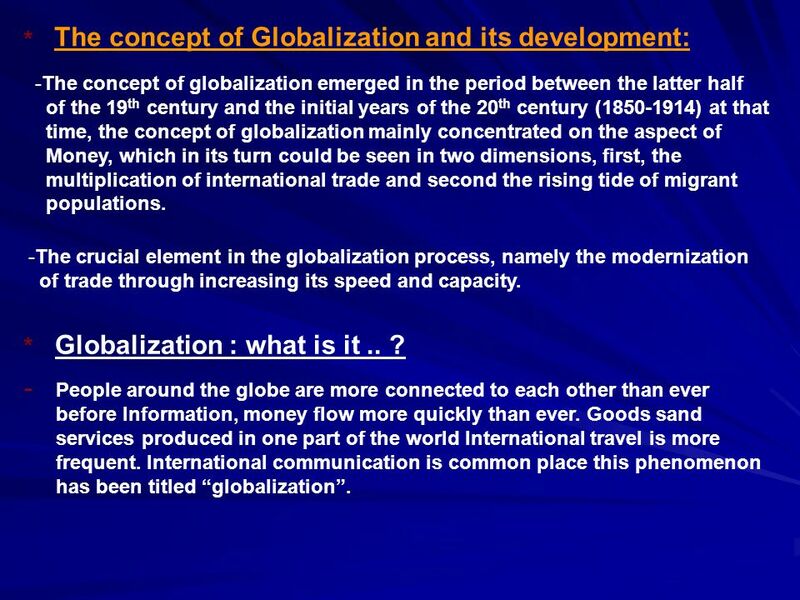 Download ppt "Youth and Globalization By Dr. Mahmoud Al Sarhan Amman – Jordan 2005." Euro med Summit, Rabat. morocco, October The Economic and social council in Jordan. progress Report. Jordan Chamber of Commerce _ Jordan Chamber. 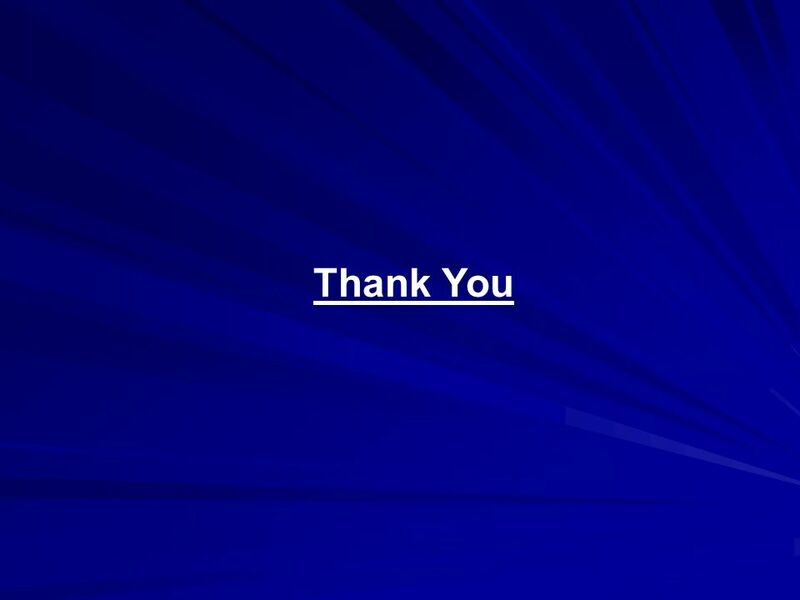 INTERNATIONAL LABOUR ORGANISATION SUPPORTING SOCIAL AND ECONOMIC COUNCILS WITHIN THE REGION: THE ILO EXPERIENCE 1. Plotting the course New goals, and a new route for Irish NGOs? The route to the summit is never a straight line. The Fundamentals of Community Economic Development. Human Security as a New Education Field: the Case of Albania Dr. Enri Hide European University of Tirana Tirana, Albania. Presented by Mostefa Boudiaf Turin, 9 July 2007 Prepared by Maria Sabrina De Gobbi ILO Employment Policy Unit - Employment Strategy Department « Trade. The EU Strategy on Disability Wallis Goelen Directorate General Employment, Social Affairs and Equal Opportunities Head of Unit Integration of People with. Presented by : Nadine Youssry 409068 Soha El-Baktoushy 409138 Walaa Samy 409077 Presented to : Dr.Nagwa Mohamed.